Coronation Street star Lucy-Jo Hudson will be answering the call of the wild as she drops in at the award-winning Yorkshire Wildlife Park on Wednesday to mark World Lion Day. The actress, a regular in the TV series Wild at Heart, will get her visit off to a roaring start by helping feed the lions at the 90-acre park. Her visit will help raise awareness about the plight of lions and help support fundraising by the Yorkshire Wildlife Park Foundation. Lucy-Jo, who played young vet Rosie Trevanion in the series set in South Africa, is a keen supporter of wildlife projects and is keen to get up close to the majestic animals in Lion Country. The park, the nation’s No.1 Walkthrough Wildlife Adventure, is home to a pride of lions rescued from terrible conditions at a Romanian zoo. 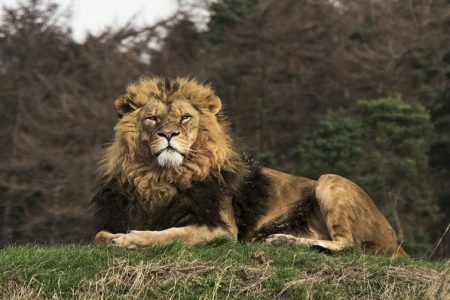 The public backed a campaign to save the lions and they now live happily in a nine-acre reserve at the park, at Branton, near Doncaster. World Lion Day is part of the global campaign to save the majestic animals whose numbers are under threat. In 1975 there was an estimated 250,000 lions in Africa, yet today the continent wide population stands at a mere 25 – 30,000 individuals. This staggering 80-90% decline combines with the fragmentation and isolation of those remaining sub-populations with little long-term viability. “It’s great to welcome Lucy-Jo as I know she shares our love of animals and appreciates the need for conservation,” said YWPF Trustee Cheryl Williams. “Their numbers are dwindling at an alarming rate and the World Lion Day campaign is close to our hearts. The Doncaster Lions are launching a year of fundraising to support YWPF’s conservation and welfare initiatives to help lions. Visitors will be able to enjoy a fun Lion Trail, a colouring competition and visit to the Lions’ Helping Hands Garden During the day there will also be talks at Lion Country to learn about YWPF’s conservation efforts and a special feeding session at 12 noon. The Foundation is currently funding a three year programme at a cost of £34,500 in Mozambique to help save lions at the Niassa National Reserve in collaboration with Fauna and Flora International conservation charity. This project is paying for a range of new measures including the recruitment of rangers to track, monitor and protect the lions. Lions Clubs International is a global organisation that is dedicated to making a difference in local communities and has 17,000 active members belonging to 900 clubs in the UK alone. Globally, the Lions International has more volunteers in more places than any other service organisation. Doncaster Lions Club member David Theyers said ` We are just ordinary people that aim to do extraordinary things. We love helping others in need and making things happen. Every day, the Lions are having fun by organising fundraising events and activities with every penny raised going to our good causes’. The Lions were started in 1917 in the US and now have over 1.4m members in 46,000 clubs in over 200 countries worldwide. YWP is enjoying a busy Summer with the new family festival events A Night in Africa proving extremely popular. Every Saturday night in August visitors enjoy an evening safari stroll coming almost face to face with some of the world’s most beautiful and at risks animals as the park stays open until 9pm. For these events, after the normal opening hours the Park based in Doncaster, will come alive from 5pm with African music, fire pits, dancing, amazing acrobats, live performers and children’s entertainment and some special guest appearances. In addition to the usual catering outlets, there will be a BBQ which will serve up delicious food for a fresh, fun event for all the family with face-painting and story-telling making a magical evening. Visitors will also be able to attend evening talks by the rangers in the different animal reserves, and enjoy the new interactive show ` Big Bugs Live’ as well as other events and attractions across the park.